"Education is the kindling of a flame, not the filling of a vessel", Socrates. 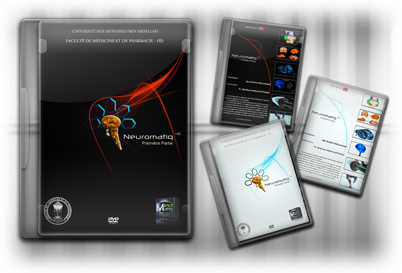 Neuromatiq or audiovisual and interactive DVD of neurophysiology and neurological disorders is a thesis project targeting medical students and others. My goal through this project is to clarify the basics of functioning of the nervous system and expose it in an elegant and concise way. Understanding how the nervous system works is a very tedious task, and despite the availability of a large number of books and references on neurophysiology in particular, they rarely leave the tradition of books based on text and some images with accompanying figures. The first torrent link ( ) Contains two iso images for the 2 mediums (Programme and DVD video). After finally completely uploaded this first version, I realized there was a problem for video of the neurotransmission on the program volume. Subjects to develop further ?